Are you ready to play Space Paranoids? The Kingdom Hearts Select action figure line travels to the video game universe of Space Paranoids, where everyone gets a high-tech makeover! 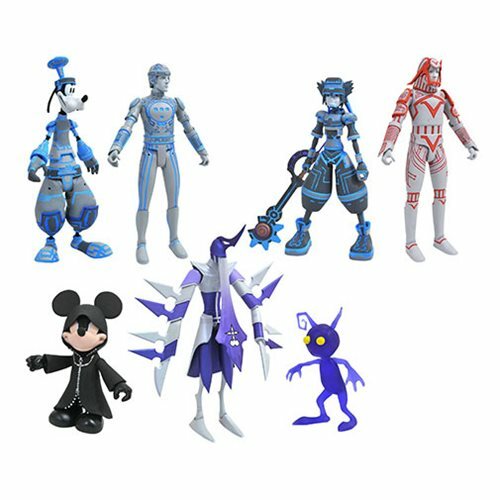 This assortment of multi-character figure sets includes Black Coat Mickey Mouse with a Shadow Assassin and a Shadow, Space Paranoids Goofy and Tron, and Space Paranoids Sora (with Photon Debugger) and Sark! Each figure features multiple points of articulation and is sculpted in a 1:10 scale, and comes packaged in display-ready Select packaging with side-panel artwork for shelf reference.